Still work in progress, but the cylinder head cover looks kinda odd with the new color. candy red will be much better! I think you better get a head built like the guy from Toy Box Racing "XBGOD" if you plan to keep up! He has the first set of 68-10.5 turbo cams from JUN. But I think Toy Box Racing is the only place you can get the Valve Train to acomodate JUN's new turbo cams. I know they pay alot of money to Port Flow to do the head work. also I've read his posts on ClubXB and he is using a Tial / Garrett GTX3071RS. I think your headed in the right direction though, looking good. Oh you might also concider that new knife-edged super crank they make. only 23lb! they took out 3lb of rotating weight! thats alot! Not to mention oil flow is greatly improved. I'm not sure where these guys came from but they have taken over the 1NZ-FE world. 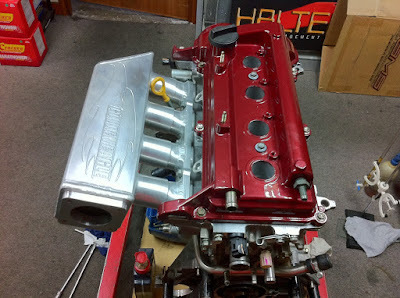 they also have a you tube video that shows how to build a 500 hp 1nz-fe. hey thanks, i'll definitely check it out when i have the time. 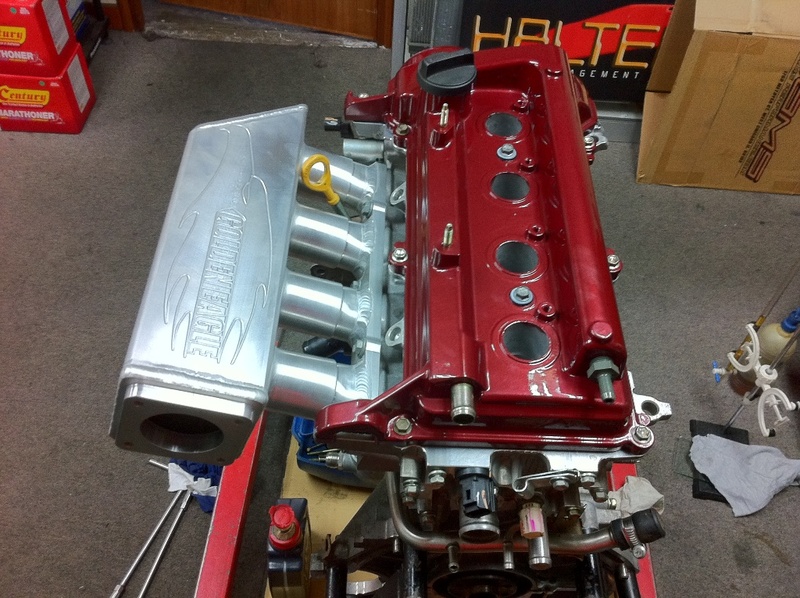 must say i'm really happy to know there are others out there pushing the limit of this engine besides myself. one correction though, my tuner GT Auto is the first to get their hands on the JUN 272 cams which is dated way back to October 2010. check my history posts and you'll see. i too had my head done at port flow as well, it's just that we didn't want to mention it publicly until we're done with the project and give the credits to tom. we had the head shipped over to california. head was done and shipped back to us way back in april 2010.
again, check my history posts and you'll see. and again, there are plenty of sources out there in the market to get parts for the 1nz-fe. 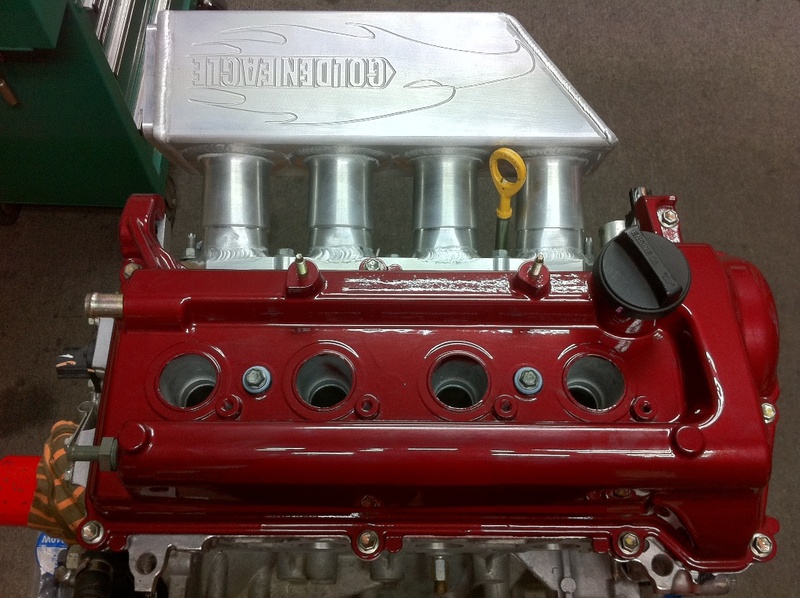 my valve springs and retainers are already upgraded when the head was returned to us. Hello this is Aras at TBR. I see someone is following you / us. Looking good bro. I did send you an email expressing some concerns. And it's no secret that Tom does the best head work in the industry. Thats awesome that you use him as well. Can't wait to see your build complete. About the cams, Junichi just sent me a text today about another new set of cams that he wants us to try. He has cncerns about the springs as well as these new cams the retainer will touch into the lip of the valve seals, so the valve guides need to be moved 1mm-1.5mm deeper to avoid the lip touching. I'll find out more when they get back in from vacation. Also I'll have the ARP studs in stock soon. So you'll be able to get rid of those adjussa head bolts that are only good for 22lb of boost before failure. I'll have 20 sets in stock in about 20 days. I also own the exclusive on that as well. no one else wanted to put out the cash to do it, so I did an exclusive with them. Let me know if you need anyhing. u dropped me an email? ok i'll go check it out later. im not using the AJUSA bolts anymore, i've gotten ARP to custom make a couple of sets for myself and for a couple of my friends. are you making some as well? if yes please do let me know so i could get a set from you and try it out here. keep pushing the envelope man, we need more people like you so that the entire community can benefit from it. i had notice ur blog since long time ago. super crazy about ur build up. i wil be doing rotrex supercharger on ncp-93 soon. this red is an odd color indeed. not sure if the pictures don't do it justice but the paint job looks cheap. hi anonymous, love to see your rotrex fitted car. pls drop me an email when it's done so i can feature it. jason, the cylinder head cover was done by a friend for free, what do you expect :) besides, it's the inside that counts, externals means nothing to me. Bro, aren't you the one I met regarding on reflash on Polo GTI at GT Auto few weeks back?